Treatable Conditions - What is Hypnotherapy Used For? Hypnotherapy is training the mind. Basically it is a super-learning technique! During consultations the client and Hypnotherapist discuss the client’s situation and needs then work together to create a treatment programme implementing positive changes in the client’s thoughts and behaviours. Modern counselling and psychology techniques are used to help make changes at a conscious level then hypnosis is used to make changes at a deeper, subconscious level so those changes last. Hypnotherapy has a Counselling and Psychology base, it combines a variety of modern counselling techniques with hypnosis. Hypnosis is utilized to make changes at a subconscious level. The conscious mind is in use during most of our activities, when we are concentrating on a task, actively thinking or learning a new skill. The subconsious mind is where these skills and programmes are then stored. The subconscious contains our habits, experiences, our programming and fundamental beliefs and these programmes, habits and beliefs shape our thoughts and behaviours. Ultimately, they shape what we do. During hypnosis, the Hypnotherapist talks directly to your subconscious mind assisting the change in negative patterns or beliefs, replacing them with more constructive, beneficial and useful thoughts, patterns and behaviours. During treatment you will be given tools to assist you with your personal growth, helping you to help yourself to adjust your thought patterns, be independent, have more control over your thoughts, behaviours and your life. Hypnotherapy is a natural healthy option and that can be used in conjunction with other treatments. The ability to go into hypnosis is purely your own, the Hypnotherapist is simply facilitating the experience. Christine Jacques is a Clinical Hypnotherapist, Professional Sports Hypnotherapist, Professional Supervisor & Author (Dip. Clin. Hyp), (Ct. Vis. Com. ), (Ct. Professional Supervision), (MNZSCAH), (MASCH), (MNHC). Mind Expansion is the exploration of how you think, expanding your viewpoint and learning to think in new ways. Some of our thoughts and beliefs are based on social conditioning, parenting, religious exposure, culture, fears, expectations and some attitudes we have simply picked up from someone else. Often limiting thoughts and ideas are not in line with our own experiences, and vice versa. Sometimes we simply hold on to these beliefs because we think they are 'the norm.' The difference between our conditioning, our experience and society's expectations or the difference between who we are and who we want to be can create confusion or inner conflict. Hypnotherapy & Mind Expansion is about rebalancing beliefs and thoughts so they work for you, so you support yourself and work toward what you want, (not what you dont want). We can change ourselves. We can change how we manage ourselves, how we cope, our perceptions, how we see the world, our thoughts, our attitudes and therefore, how we experience life! To get your mind working for you and to get your mind supporting your capabilities! Just as you clean your house or empty the bin, we also operate better if we get rid of the clutter and the 'junk' thoughts. By freeing ourselves of old blocks, bad habits or self limiting beliefs we are able to operate more efficiently and constructively, therefore we are more likely to achieve our goals and reach our true potential. Thoughts, beliefs and emotions affect the operation of your mind and your body. The mind and body connection is inseparable. You cannot have an injury or illness with out it affecting your mind. Likewise, thoughts affect the body (eg, blushing when embarrased, erection when aroused, muscular tension when anxious). Thoughts affect your physical condiiton, the rate in which you recover, adapt and/or learn new skills, they affect your interactions with other people and how you experience the world. For more information see the Treatable Conditions page and the Frequently Asked Questions page. "The mind drives the body..............The mind often determines what the body feels, so it is important the mind is in alignment with what we are doing and especially with what we want to accomplish in life." 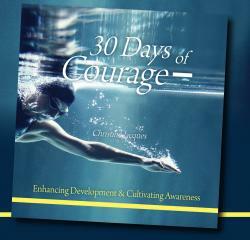 30 Days of Courage - Enhancing development & Cultivating Awareness by Christine Jacques. The book is about broadening your awareness of yourself, realising your personal strengths, building self-worth, discovering how your think, what you think and why. We are often so busy dealing with 'the stuff out there' that we can lose touch with what is happening on the inside. The true self (the 'in here'), can get left until last. And the more we ignore our 'true self', the less we know about our self and the less we honour our self. The book's purpose is to assist with reconnecting within, realising your truths, your resoucefulness, building self esteem, self belief, getting to know yourself better, developing real authenticity and real courage. Thank you to all those have supported this project. Many thanks to the following people involved in this website.